Two of the new county Hele On buses which were blessed and put into service Friday (Jan 29). Keiki from Keaukaha took a ride in the new Hele On buses and performed songs for the blessing program. Miss Kona Coffee Wikolia Enos joined the group for the program. The county rolled two new Hele On buses into the fleet Friday (Jan 29) with a blessing and seats full of kids. The buses are part of a package of nine new 33-and-49 passenger coaches. Seven were purchased with federal monies earmarked through the efforts of U.S. Senator Daniel Inouye while two of the buses were purchased with monies from the Puna Geothermal Asset Fund with the assistance of Councilperson Emily Nae‘ole-Beason. The new El Dorado buses are equipped with air conditioning, fully padded seats, wheel chair lifts, bike racks and stereo sound. “We are pleased to announce this increase in new buses and routes raising the fleet to a total of 59. 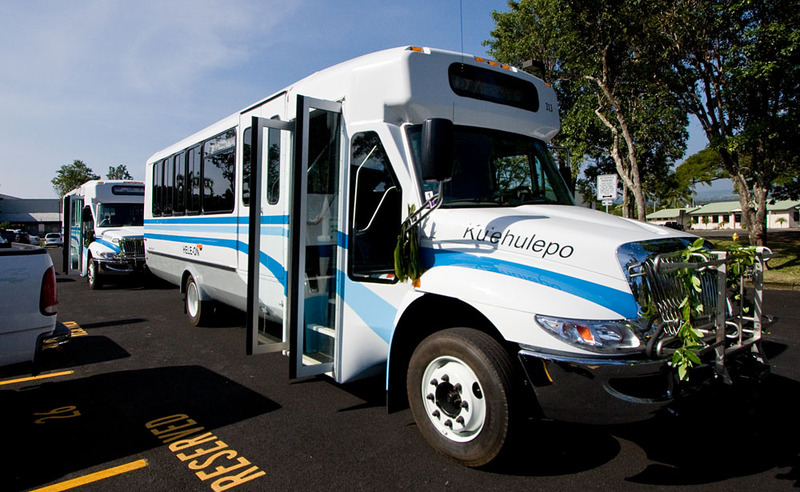 Aside from having more seats available, the public will be in for a really comfortable ride,” according to Hawai’i County Transit Administrator, Tom Brown. Kumu James “Kimo” Luluhiwalani Awai III conducted the blessing with the assistance of 60 Keaukaha community children. The new buses have been given Hawaiian names honoring specific winds of various geographical locations from throughout the County of Hawai’i. 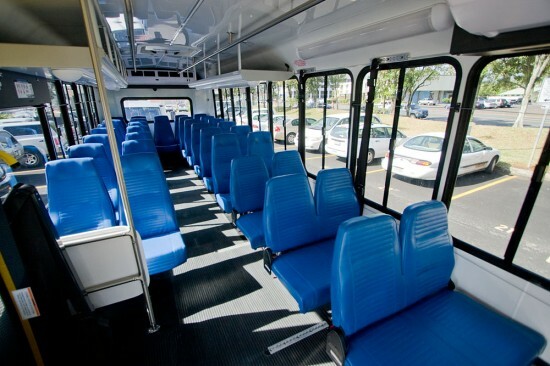 Padded seat and air conditioning await passengers in Puna where the two new buses will be put into service.